In this construction video tutorial, you get some quick tips to identify a hidden beam & read the reinforcement of the beam. Hidden beam stands for a reinforced concrete beam that is set up within the depth of supporting slabs. Hence, the depth of hidden beam remains equivalent as slab depth. Hidden beam is the part and parcel of modern reinforced concrete framed structures. 1. It saves on floor height clearance. 2. Hidden beam saves significant cost of formwork, labor, and materials. The hidden beams are mostly recommended for three types slabs like waffle slab, ribbed slab and solid slab. All the dimensions are provided in feet and inches. M20 grade concrete mix should be used unless or otherwise stated. Yield strength of all tor steel should be 500 N/mm. All concrete should be mixed and vibrated through machine. All dimensions are to be study not to be calculated. All dimensions & details should be examined with the architectural drawing unclearness and if anything is found, it should be informed to the concerned engineer. Wherever illustrated beam bar should be anchored into column up to a length equivalent to 57x bar dia. Distance calculated from column face. Bars should be cut and bent adjacent to openings/pockets. There are two types of drawings for slab. 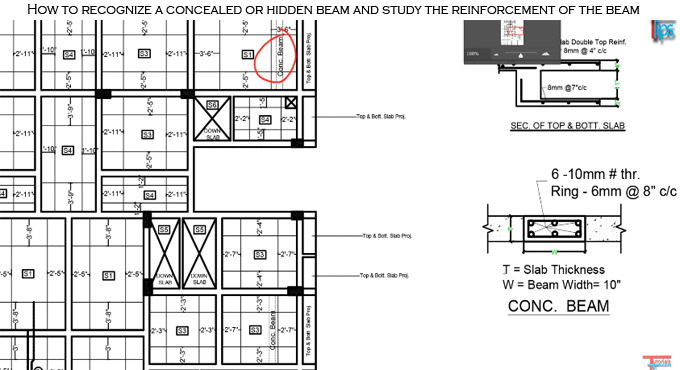 In one drawing, details are given for slab along with concealed or hidden beam. In another drawing, the details about are given for beam.